The myth of maintaining balance. 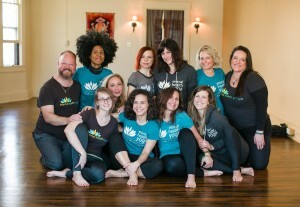 Balance is the new buzz-word among yoga practitioners. It is something we all are certainly striving for! We want to eat a balanced diet, balance duties at work and home, and otherwise live balanced lives. In fact, just the feeling that we are out of balance can become a source of stress and anxiety. Living in balance becomes a second job! We tend to approach balance as a destination. Actually, balance is more like a journey. It isn’t a place that we get to and just hang-out. Balance is a state of being that we are always cultivating, but not one that can be sustained. Imagine a tightrope walker transiting her rope from her place of origin to her destination. In order to stay balanced, she must find her center of gravity and position it over her base of support. She may hold on to a pole or stretch her arms out to the side to avoid falling over. If she finds herself tipping too far to the right, she sways to the left. If she feels as if she is going to fall forward, she draws herself back. Standing still would practically guarantee she would not be able to maintain her balance! The same is true for us. Balance is not found in stillness. Rather, we find it when our movements direct or accommodate the life’s flow. Life is like a dance. It takes two steps to its right. We take two steps to our left. We are spun, dipped, and twirled around the dance floor. We briefly pause to catch our breath, but if we try to stay in that space of stillness, life will surely step on our toes! Fear of falling itself can prevent us from maintaining our balance. We can feel the unsteadiness beneath our feet and tighten up. We become rigid and topple over. Then we say to ourselves, “You see? I knew I couldn’t do it.” Being balanced isn’t about not falling. It is about falling and then trying again and again. 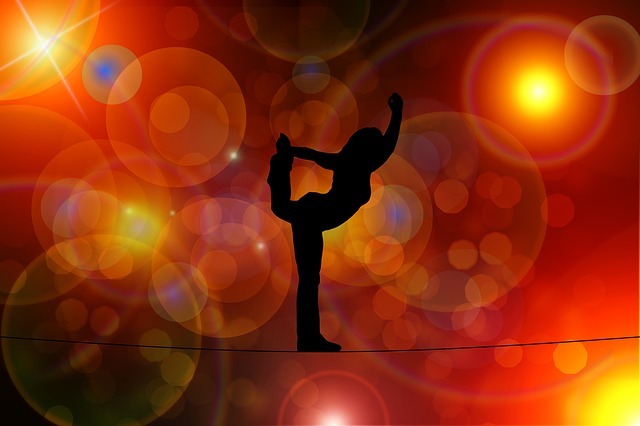 Each time we attempt balance we may find that it feels more familiar. Perhaps we maintain our balance a little longer. Perhaps we just fall a little softer. Balancing is a much better state to strive for than balance itself. Balancing indicates that we are practicing the dynamic process of stillness. We position our metaphysical center of gravity (that which we devote our practices to) over our spiritual base of support (such as yogic practices and our spiritual community). We experience the dynamic nature balance most keenly in balancing asanas. Many people find arm balances particularly challenging, and invigorating! Bakasana is an awesome arm balance for many people to begin with. Begin in Tadasana (Mountain Pose). Squat down low and place hands and palms on the floor. Bend knees and elbows to the sides. Place the right shin on top of the right triceps (back of the arm) and the left shin on top of the left triceps. Lean forward and take the head and chest down, gaze focused slightly forward at a spot on the ground. Lighten the load on the feet. Perhaps come to tip-toes, raise one foot off the ground, raise the other foot off the ground. Perhaps take both feet off of the ground! Keep head lifted and remember to breathe. To release the pose, bring feet back to the floor. Rest in child’s pose or enjoy any other stretches and movements that feel good. Stretching and circling the wrists can be nice after practicing Bakasana. Mehta, Silva, et al. Yoga: The Iyengar Way: The new definitive illustrated guide. Dorling Kindersley, 1990.